Australian actor Hugh Jackman looks tired playing Wolverine. Granted, anyone would give off the same level of weariness if they played the same role in nine films across 17 years, so there's very little blame to be laid at the actor's feet here. It isn't a tiredness in having to play Wolverine so often, though, that makes the fatigue so palpable in the movie Logan, the actor's latest and presumably final appearance as the most famous member of the X-Men squad. That's simply his emotional mindset being conveyed in this latest entry into the X-Men franchise, the culmination of an exhausting life for the self-healing mutant. Packing as much emotional punch as it does sci-fi, blockbuster thrills, Logan ends up being a near-perfect sendoff for the character and exactly what any fan of this series would want in a finale for the beloved character. Set further in the future than any X-Men film before it, Logan finds the character attempting to live a quiet life under the radar and far from view of those who have been hunting the mutants. He scrapes together what money he can driving a limo in a small town on the Mexican border. He makes frequent trips south of the border to deliver necessary medication to his longtime friend, Charles Xavier aka Professor X (played once again by Patrick Stewart) who is now fully engaged in a troubling battle with Alzheimer's. The little bit of money Logan can put aside is for a boat that will serve as the duo's escape into full obscurity and safety from those still hunting their kind. It's a harder world for Logan than ever seen before, but it's nothing the mutant badass can't handle with a few slashes and swipes from his Adamantium claws. Matters are only complicated more for Logan, though, when a mysterious woman offers him the money he needs to drive her and a young girl, Laura (played by newcomer Dafne Keen), up north to the Canadian border. You see, Laura has mutant abilities, an anomaly in this world where the last mutant was born nearly a quarter of a century before. With Professor X in tow and a new group of mutant hunter's hot on their trail, Logan finds himself quickly drawn back into the world of dangerous violence and painful strife that has been scarring him inside and out for hundreds of years. As with the previous, standalone movie for the character, The Wolverine (released 2013), the engaging thrills and hard-hitting action come courtesy of direction by James Mangold. This time around, though, the filmmaker seems almost gleeful in bringing the ultra-violence of the character's world to the big screen. Logan is packed with violent imagery, much of it coming in the form of Wolverine's claws stabbing his enemies in the head. Mangold understands Logan's violent world and never shies away from the darkness that's been weighing on the character's soul his entire life. It helps that the X-Men franchise has taken this slight turn towards darker tones, last year's Deadpool opening the doorway for the franchise to feature necessary, R-rated material. Don't let the R-rating fool you into thinking this movie is all blood and guts – not to mention a barrage of F-bombs dropped by Wolverine as well as Professor X – without emotional impact, though. 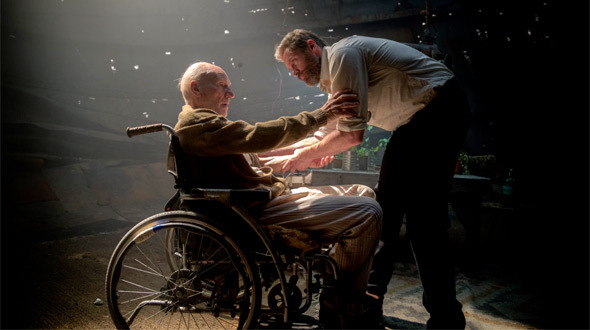 With help from a screenplay written by Mangold, Michael Green, and Scott Frank, Logan delves deep into the character's relationship with his fellow mutants, most notably the love he still has for Professor X. The characters understand each other even if their respective abilities come across as something of a danger to one another. Professor X's abilities combined with his mental deterioration serves a sad and troubling future for the one-time protector of his kind, but he knows all too well the path Logan must take to achieve his own sense of redemption. This is a key theme in Logan, and, for all of its darkness and weight, the film takes long strides in allowing the character a notion of absolution before his time comes to an end. It helps that Jackman continues to bring his all to the character despite this being his ninth appearance as the character. That sense of fatigue mentioned earlier only serves the character and this future world, something of a post-apocalyptic world for the mutants, in which he's trying to survive. With bloodshot eyes and haggard skin, Jackman certainly gives the appearance of a battle-worn survivor in this melancholic future. It's in his performance throughout the film, though, that the actor does his finest work playing this character to date. Logan is allowed an even deeper sense of emotional loss than ever before, and Jackman elicits all the necessary pain and anger the character is feeling with incredible skill. His supporting cast does wonders in building the emotion, as well. Stewart has never been required to play Professor X with this level of depth and apparent loss, and the skilled actor, as with the lead, does his finest work to date in this role he's also been playing off an on for 17 years. Elsewhere in the cast in Keen who serves as much more than the MacGuffin her role could have been viewed as in a lesser film. The young actress delivers on the weight her role requires while still nailing the moments in which her character's abilities reveal themselves. Boyd Holbrook and Richard E. Grant are solid as the film's antagonists, the mutant hunters of the future who appear to have some sort of control over the mutant gene, and Stephen Merchant gives a surprisingly playful performance as Caliban, one of the last mutants aiding in Logan and Professor X's attempt to hide. With depth and energy alike, Logan blends the elements that have made the X-Men franchise work so well thus far into an emotional and thrilling finale for its lead character. The film's setting puts it at the end chronologically, but that doesn't mean this is the last we'll ever see Jackman donning the claws and mutton chops that made him a star so many years ago. Nonetheless, if this is the very last Wolverine outing for the actor, he certainly goes out on a high note. Mangold's Logan delivers everything you would want in an endgame scenario for the comic book character, a perfect melding of emotion, violence, and even a slight dose of much-needed humor. There's an easy and definite case to be made for Logan as the finest hour for the X-Men franchise. It's certainly the case as far as Jackman goes.